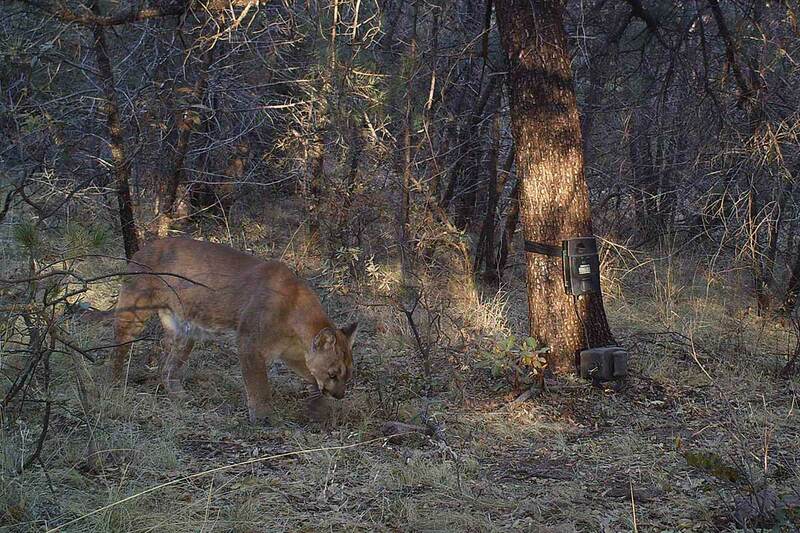 Remote cameras allow us to detect mountain lions and estimate their density in our study site. Between April 2011 and October 2014, our research team captured 21 mountain lions (12 female, 9 male) in the mountains of west Texas. Mountain lions were captured using foothold snares or trained hounds. After being fitted with a GPS monitoring collar (or an expandable VHF monitoring collar for kittens) each mountain lion was released at the site of their capture. 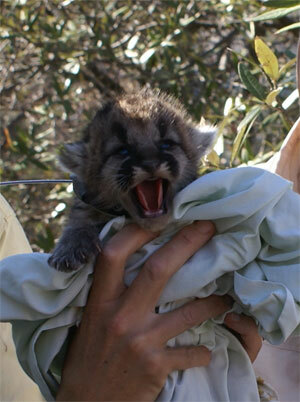 Mountain lions were monitored with GPS and/or VHF collars for an average of 195 days (range = 20 to 649 days). Five of the seven collared adult females were accompanied by young at some point during their monitoring. For animals in this study, ages at the time of first capture ranged from 4 weeks to 5 years. Captured animals were grouped into 3 age categories based on mountain lion life history. We captured 2 “kittens” (1 female, 1 male). Kittens are cats less than 1 year of age that are still reliant on their mother for some or all of their needs. We captured 9 “subadults at dispersal” (4 female, 5 male). Subadults are cats between the ages of 1-3 years old. The subadult stage is generally the time when a mountain lion leaves its natal range (the place where it was born), and establishes its own home range. The remaining 10 captured mountain lions (7 females, 3 males) were classified as “adults”, which are cats that are 3 years old or greater. Adults are generally independent and have their own established home range. Collars were equipped with mortality sensors which alerted researchers when the mountain lion was inactive for at least 24 hours. When property access allowed, mortality signals were investigated in person to determine the cause of death. Nine monitored mountain lions were known to have died over the course of the study, 7 due to predator control, 1 during re-capture, and 1 due to unknown causes. Based on this mortality data, annual survival for mountain lions was estimated to be 0.536, meaning that about 54% percent of the population survives each year. This rate is similar, though at the low end of previous estimates of mountain lion survival in the Trans-Pecos, and is among the lowest in the United States. The fact that this mountain lion population continues to exist with such high mortality rates may indicate that the population is being sustained by either high rates of mountain lion immigration from other mountain ranges, high reproductive success, or both. Future research by the Borderlands Research Institute will explore this further to determine what is sustaining the population of mountain lions in the mountains of west Texas.